From the Talleres [factories] de Los Ballesteros in Taxco, Mexico this necklace is stylized and made to lie flat at the neck. It is substantial in weight and when open the two sections articulate to make it easy to put on and take off. 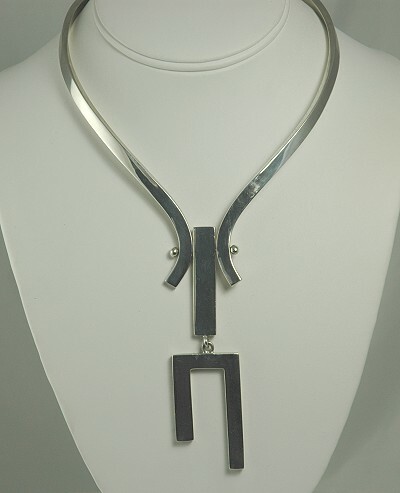 This piece is fully marked on the reverse of the articulating pendant. The marks indicate the piece was made during the 1948-1980 period. Condition:SOLD Excellent vintage. Normal wear expected from age and use noted. Measurements: 9 1/4" long from the back to the end of the design on the front. The ring is approximately 4 1/2" wide at the widest point.